UNITED NATIONS, July 24 -- Not only does the UN refuse to answer or now often even take questions: it is making it harder for the press to cover the Security Council and General Assembly. Complaints have been mounting for weeks, of UN Television being unintelligible, playing "English Only" though this is the UN, even blacking out speakers, from Palestine's Saeb Erekat and the UN's Hilde Johnson. Wednesday after these complaints, Inner City Press on behalf of the Free UN Coalition for Access asked Secretary General Ban Ki-moon's outgoing Deputy Spokesman Eduardo Del Buey what FUNCA has raised for day to the UN, video here from Minute 11:35. The UN wireless Internet in front of the Security Council often does not work. Inner City Press including this in a story (on Burundi) on July 22, and FUNCA has been following up ever since. Journalists cannot hear what happens in open meeting while also waiting to ask questions. That seems to some to be the goal. While the Security Council stakeout before and during the relocation had a media work table in front of it, now by decision of the Department of Public Information it does not. Ironically DPI's new UNTV contractor TeamPeople does have a table, and even plugs in to their electrical outlet in such a way that reporters cannot go to the other end of the stakeout to speak to diplomats. The lack of a table was justified on aesthetic grounds, misplaced; but these do not seem to apply to DPI's own contractors. 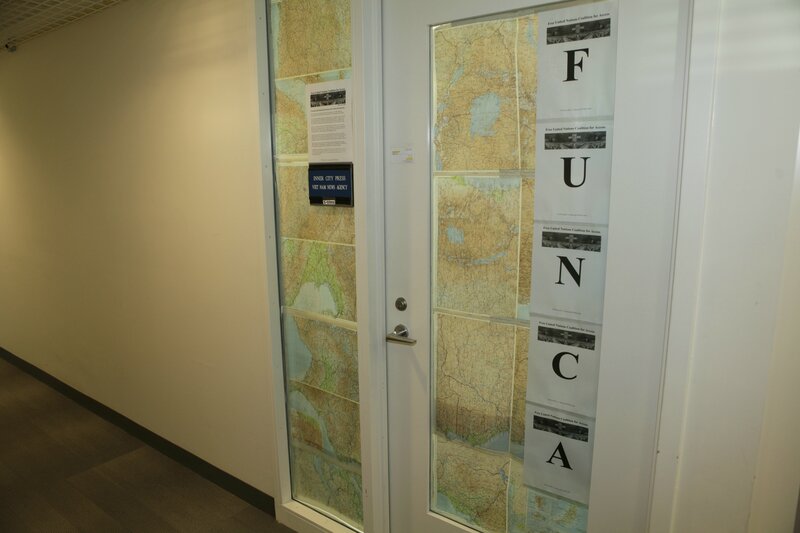 After FUNCA advocated on these issues and turned in a petition with signatures from resident correspondents on several continents, DPI's response was to threaten to suspend or withdraw Inner City Press' accreditation, for hanging a sign of the Free UN Coalition for Access on the door of its shared office, photo here. This comes as Inner City Press and FUNCA have shown that the United Nations Correspondents Association's first vice president Lou Charbonneau immediately leaked to DPI an internal UNCA anti Press document. Click here for story, here for document. Neither the UN nor its UNCA have taken any action on this. 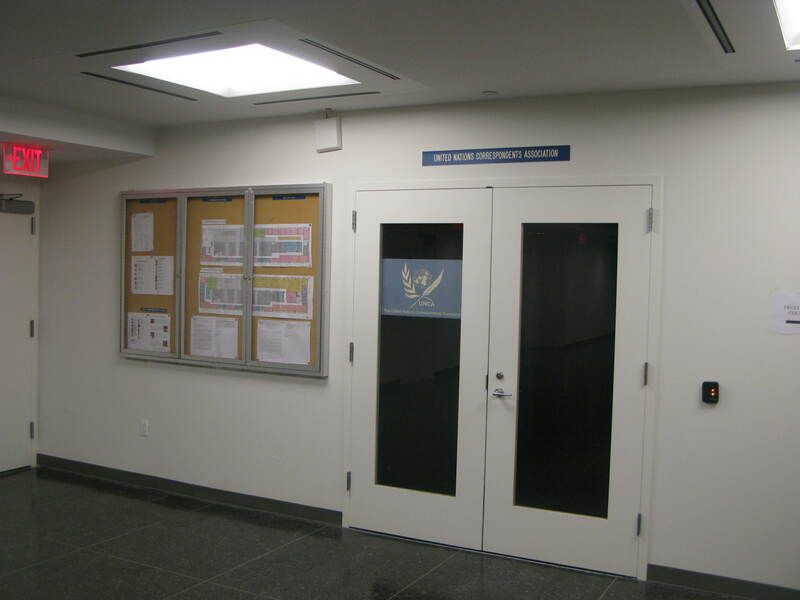 Meanwhile DPI allows its partner UNCA, increasingly the UN Censorship Alliance, to have two signs, a big meeting room, a locked pantry for its wine glasses and its own office. But there's more -- DPI has also given UNCA intern(s) "P" (Press) entry passes, and allowed them into the UN briefing room and stakeout. DPI tells even diplomats, at least those from some countries, they can't come into the briefing room. But a non-journalist intern of UNCA (the UN Censorship Alliance) is allowed in, repeatedly. Why? See e.g., video here, at Minute 0:44. But there's more! DPI promised correspondents that they would be UN telephones, to for example call people in the UN Missions in the Congo, Sudan, Somalia and Haiti, in the so-called focus booths. Then FUNCA was told this is not possible, the focus booth are being given to journalists. Well, the focus booth closest to Inner City Press' (and FUNCA's) shared office has had the UNCA intern in it. Long time journalists weren't allowed to use this space, had their passes changed due to lack of a space. But the non journalist, introduced to Deputy Secretary General Jan Eliasson by UNCA's 2013 president Pamela Falk of CBS as "one of our interns," was working in there with a "P" Press pass. That's why there's no phone service to the UN Peacekeeping missions? Watch this site.